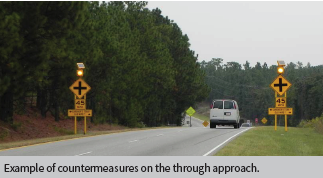 For more information about this Proven Safety Countermeasure, visit the Office of Safety's Presentation: Intersection Safety Implementation Plans web page. This systemic approach to intersection safety involves deploying a group of multiple low-cost countermeasures, such as enhanced signing and pavement markings, at a large number of stopcontrolled intersections within a jurisdiction. It is designed to increase driver awareness and recognition of the intersections and potential conflicts. The systemic approach to safety has three components: (1) analyze systemwide data to identify a problem, (2) look for similar risk factors present in severe crashes, and (3) deploy on a large scale low-cost countermeasures that address the risk factors contributing to crashes. Doubled up (left and right), oversized advance intersection warning signs, with street name sign plaques. Enhanced pavement markings that delineate through lane edge lines. Doubled up (left and right), oversized advance "Stop Ahead" intersection warning signs. Doubled up (left and right), oversized Stop signs. Retroreflective sheeting on sign posts. Removal of any vegetation, parking, or obstruction that limits sight distance. Source: T. Le et al, "Safety Effects of Low-Cost Systemic Safety Improvements at Signalized and Stop-Controlled Intersections," 96th Annual Meeting of the Transportation Research Board, Paper Number 17-05379, January 2017.